Salesforce is an enterprise level Customer Relationship Management (CRM) platform. When you connect Salesforce to GoSquared, you'll have the ability to send leads you acquire through GoSquared directly to Salesforce. Note: Salesforce is an enterprise level integration. Please get in touch with our sales team if you'd like to know more. Why Should I Integrate Salesforce with GoSquared? 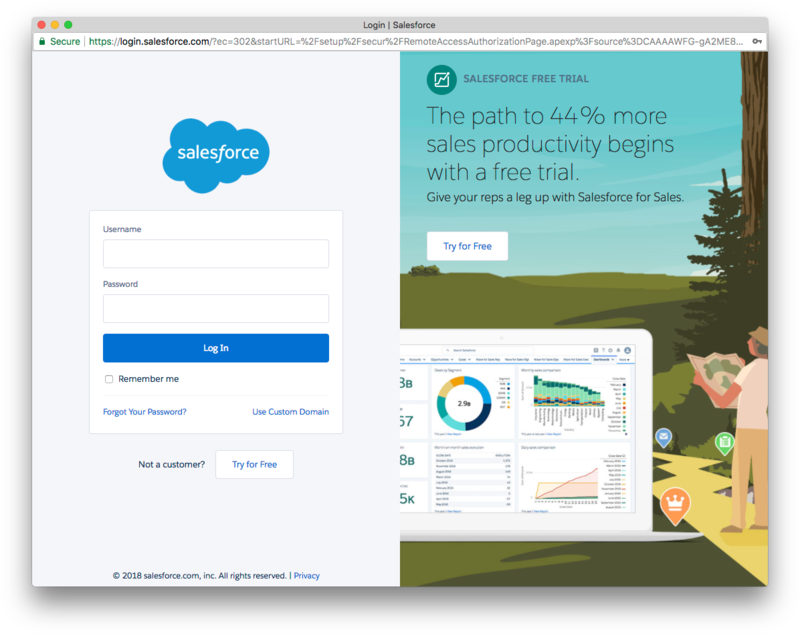 After qualifying a lead over live chat, you can just click a button to instantly send them into Salesforce as a new Contact. Set up Smart Groups with lead qualification rules that will automatically send new contacts to Salesforce when they match your specified criteria. What information can be sent to Salesforce? First and last name – must be set for the integration to work. The Lead Source field in Salesforce will also get set to GoSquared. Note: to use this integration you'll need to have a Salesforce edition with API access, such as Enterprise, Unlimited, Developer, or Performance with the optional API access add-on. 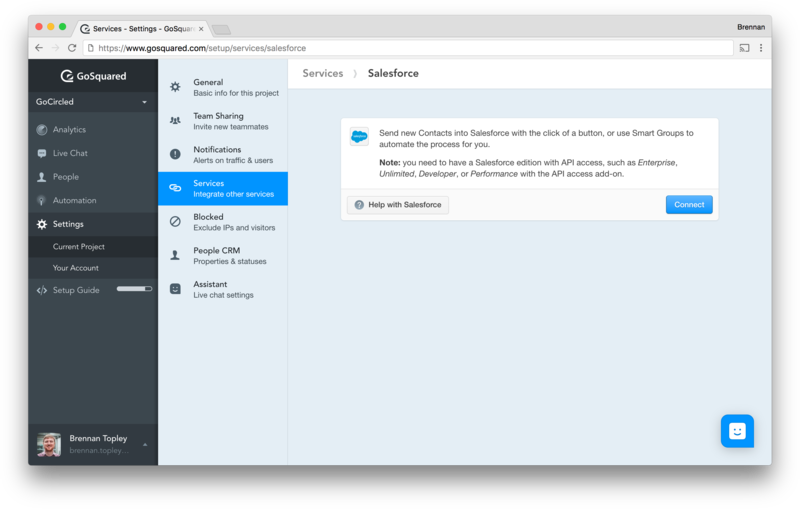 Log into your GoSquared account and head to Settings > Current Project > Services and select Salesforce from the list. If you have more than one project in GoSquared, ensure you've selected the right project first! 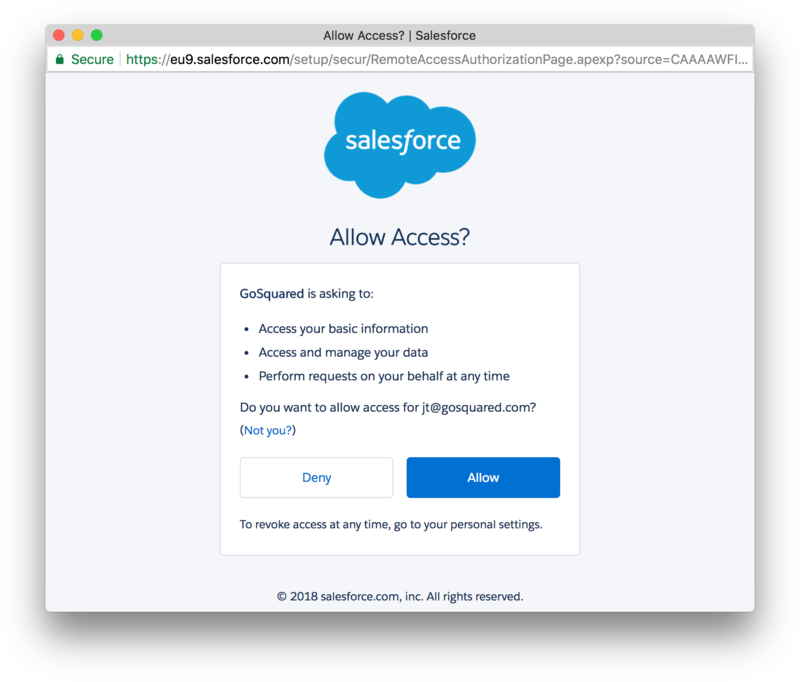 Click Connect — this will open a new window where you'll be asked to log in to Salesforce to and grant GoSquared access. Select which version (experience mode) of Salesforce you use, either Classic or Lightning. This affects how GoSquared generates links to your Salesforce dashboard. After connecting your Salesforce account, you should notice a new Add to Salesforce button has been added to the dropdown menu on each profile (it's at the top of the sidebar). You can't add a completely blank lead to Salesforce – so make sure you have at least the name property filled in in GoSquared before you try sending them over to Salesforce.You can manually edit the properties before sending them over if you like. Then just click Add to Salesforce and they'll instantly be created as a new Contact in Salesforce. If you’d like to automate the process of adding a contact to Salesforce, you can do so through GoSquared Smart Groups. You’ll need to start by creating a GoSquared Smart Group You can set the filters to something relatively broad, like 'recently created’ to capture all contacts or you could build a smart group with lead qualification criteria such as ‘visits greater than 5' and 'visited your pricing page’ It’s completely up to you! Once you have you Smart Group set up, head to Settings > Current Project > Services > Salesforce and you’ll see the option to Add Smart Group. Click Add Smart Group and choose which Smart Group you want to use. As soon as you’ve clicked ‘save' your automation should be set up and ready to go.